President Maithripala Sirisena yesterday called on State banks to focus on providing affordable financing to entrepreneurs, pointing out that generating colossal profits alone was insufficient to promote the welfare of the country. The President addressing the ‘Enterprise Sri Lanka’ program launch at the BMICH on Friday acknowledged that Small and Medium Enterprises were the backbone of the economy and critical for job creation and for tangible economic benefits to filter to the masses. He pointed out that State banks generally performed well, generating significant profit, but stressed that as public banks they had a responsibility that went beyond mere profit creation to improving the economy of Sri Lanka as well. “We have to ask ourselves whether banks exist to generate profit or whether they are able to exert themselves and provide services to the people. In my view State banks have multiple roles to play, perhaps 50% of their effort should be focused on profit generation and 50% in providing services to the people,” he said. While acknowledging that profits were important to fund the economy and by extension the Government, he highlighted the need for capital flows to be equitable so that different segments of society would be able to benefit from the country’s financial system. 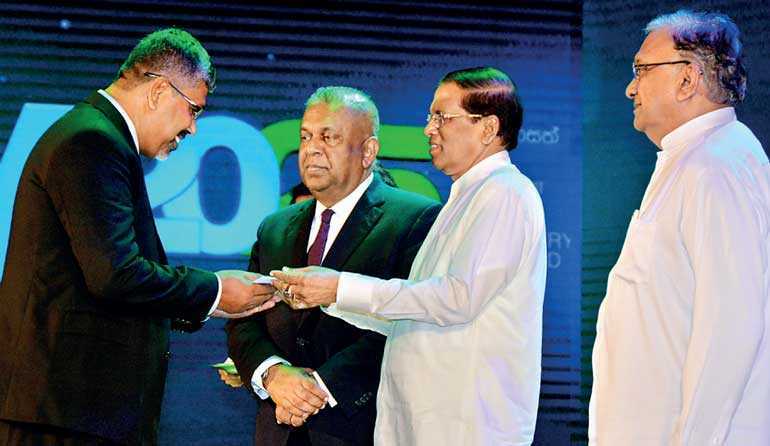 He praised the Government, and in particularly Finance Minister Mangala Samaraweera, for formulating the program that aims to create 100,000 new entrepreneurs by 2020. However he pointed out that it was imperative to create awareness and improve financial literacy of people so that they do not unwittingly become indebted to banks and find it more difficult to live. The program has 15 tailor-made local- and donor-funded financial and non-financial schemes under the umbrella. The credit program aims to provide access to finance at an affordable rate with the Government guaranteeing some of the loans and providing concessionary interest rates. The most challenging issue that is faced by Small and Medium Enterprises is access to finance and absorbing high interest rates, officials acknowledged at the event. President Sirisena noted that it was imperative for State organisations, including ministries and departments, to support the Government’s latest efforts to promote entrepreneurship on a large scale by improving market place access and enabling small businesses to be more competitive. However, he acknowledged that Sri Lanka could not grow in isolation as technology, expertise and knowledge would have to come from elsewhere. He recalled that in the past many more products were manufactured in Sri Lanka but now even kites and Vesak lanterns were imported, reducing the creativity and enterprising nature of locals. He advocated for renewed investment to tap into new ideas and use technology in different ways to solve problems and raise the standard of living for all Sri Lankans.